Fancy getting mauled by a tiger? Posing as a mermaid? Neighing like a horse? Well, at the Victoria and Albert museum on Friday night that’s exactly what four members of the Oninlondin team did. Why you might ask? To go on a treasure hunt (of fine art) of course! The event was part of the Friday Late events that occur at the Victoria and Albert museum and was free. The hunt was organised by THATmuse which stands for Treasure Hunt at the Museum. The company originally started as THATLou (au Louvre) in 2012, expanded to the Musee d’Orsay in 2013 and the streets of Paris in 2014. 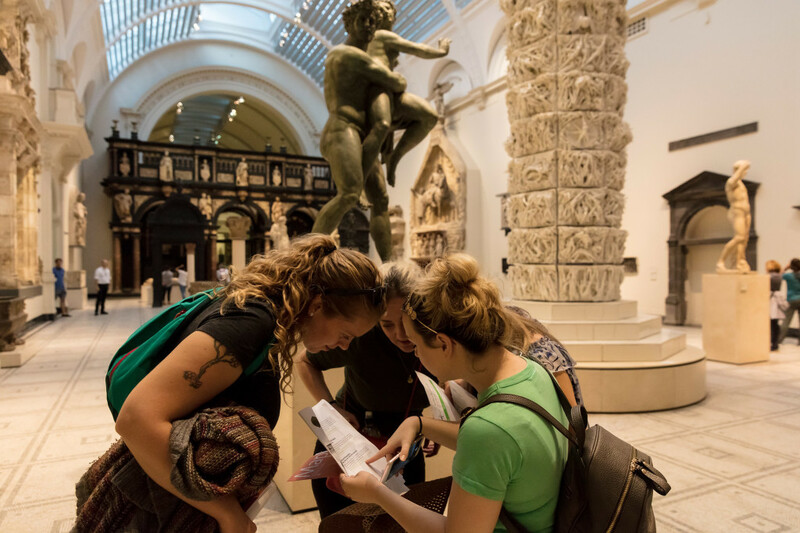 In 2015 they were commissioned by the British Museum to create a treasure hunt. The company then united all the hunts (which previously had different names) under the name THATMuse. 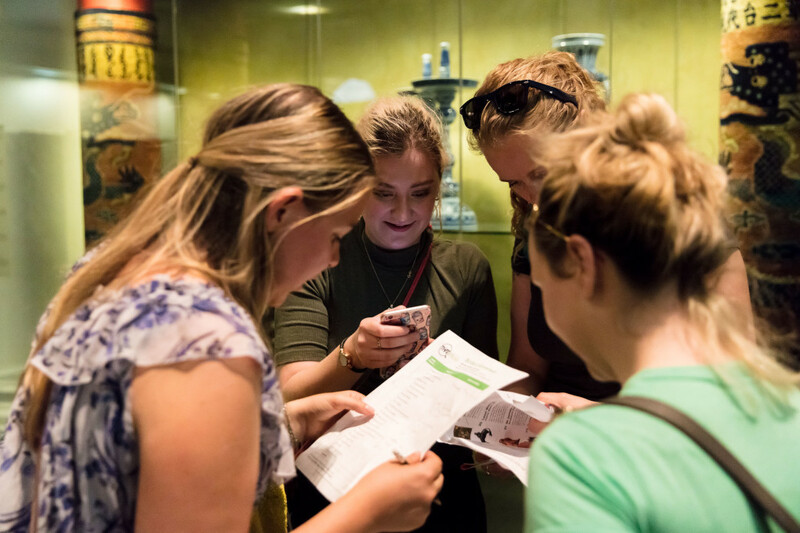 The aim is to get people engaged in art in a creative and fun way that makes people curious to come back to the museums.There are a range of themes on offer. This particular theme was travel, so the questions and artworks were connected to travel. Individuals were allotted to teams of around four players, so it was a good event for individuals, couples and groups. Each team is given a map of the museum, the 25 task descriptions and a score sheet. Then we had a short time to strategise: should we start with easier tasks first? The ones worth the most points? Start at the furthermost point away? Who is the best with social media? Who is good at reading maps? There tasks comprised either answering questions, re-enacting a scene or posting photos to social media using the given hash tags. It’s best to wear comfy shoes and clothing due to running around. Also make sure your phone battery is charged ready for all the photos and videos that earn you extra points. There is a 90 minute to 2 hour timeframe, so you need to balance strategy with being quick, efficient and punctual. We managed to complete all questions and complete the social media tasks (except two) in the allotted time frame. We were unable to complete those two as one wing of the museum was closed and the other had an event on. The host was fair and declared both would not be counted in the final tally. The introductory part of the night seemed rather long while teams were being sorted, however, we later found out 142 people participated in a hunt meant for 100, and that they had to turn over 100 people away. So be sure to book in advance or turn up early to avoid disappointment. It was unfortunate that some parts of the museum were not accessible. The scoring could have been clearer as it was difficult to work out the social media points for the final tally. The microphone situation could also improve as even though we were sitting close at one point it was difficult to hear. However, as this was the first time this event was held at the Victoria and Albert Museum, I am hopeful that these kinks can be worked out prior to future treasure hunts. The hunt was fun, engaging and elicited much laughter. We also got to know more about each other, so it’s a great team building exercise. We may even have gained some knowledge (shock horror), such as names of travelling saints, the attribute St James carries, shipping ports and the material of swimsuit on display. The hunt is suitable for families, young people, groups and corporate events. I would highly recommend THATMuse at the Victoria and Albert Museum. Indeed, the hunts at the British Museum, Musee D’Orsay and the Louvre all seem extremely interesting too and I’d love to have another fun-filled, treasure hunting evening in the near future.